Fraseropolis recently did an opinion piece on the Surrey Light Rail Transit proposal. And while that may or may not be pretty interesting in its own right depending on what you think, a comment posted by a Brendan Dawe did interest me a lot in its description of the realities surrounding at-grade (on-street) light rail transit. What I don’t see is how an shared-grade line intended to be *rapid transit* is pedestrian friendly. 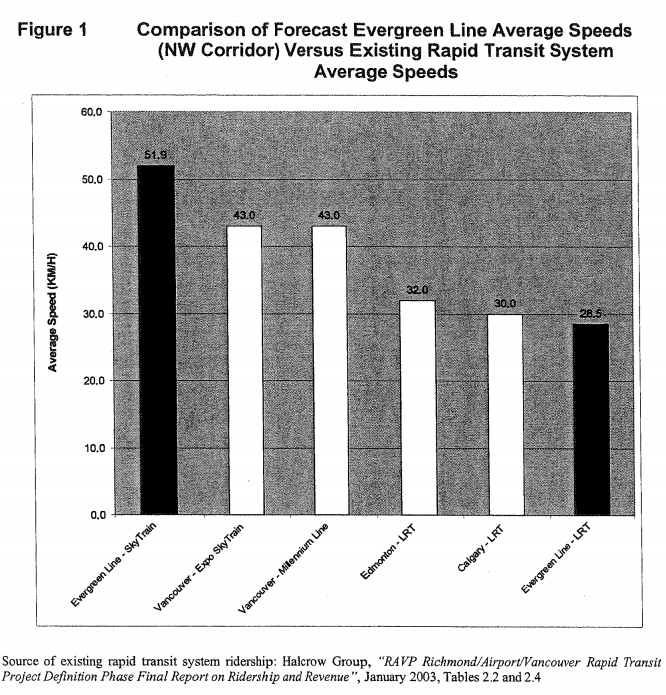 Sure, if it’s going streetcars speeds than it may be, but that’d be a considerable sum to ask the rest of the region to chip in for a project that does not improve mobility overall, and as such the choice of rail over rubber would be really an aesthetic position, and as Vancouver is supposed to be paying for the non-technically-necessary costs of tunneling under Broadway, it would make much more sense to ask Surrey to pay for the extra costs of installing rail and electrical systems. If it’s going at something approaching rapid transit speeds than it’s outright pedestrian unfriendly – it’s a fast train going down the middle of a street. If it’s to be operated with the sort of priority over the street that makes practical use of the capabilities of rail transit, than it will require reduction in potential pedestrian connectivity by limiting cross walks and signal preemption. That sort of issue is why many regard shared-grade rail as inappropriate for Broadway and it’s abundance of close-spaced signalized intersections. 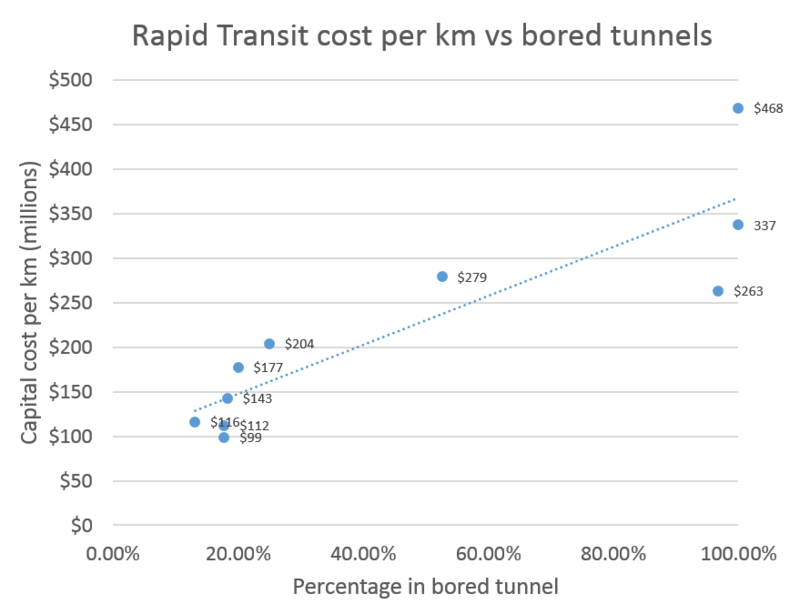 If elevated rail is transit’s freeway, shared-grade rail rapid transit is it’s stroad, – slow enough to be limiting, fast enough to be dangerous, and expensive to build and operate all the same. I don’t think your observations on development form are really based on anything inherent to particular transit modes, but rather a result of what municipal governments have permitted. There’s a huge amount of demand for space in this region, and in it will take the densest form that city planners allow in reasonably well located sites. At Brentwood and Metrotown, it’s towers, while at Royal Oak or Commercial-Broadway it’s low rises and at Nanaimo and 29th Avenue it’s nothing at all. This is because Burnaby encourages dense development at official town centers while Vancouver hasn’t until recently allowed any development in SFH neighborhoods. If Surrey wants lowrise development, than it’s entirely within the competence of the authorities in Surrey to limit low-rises. 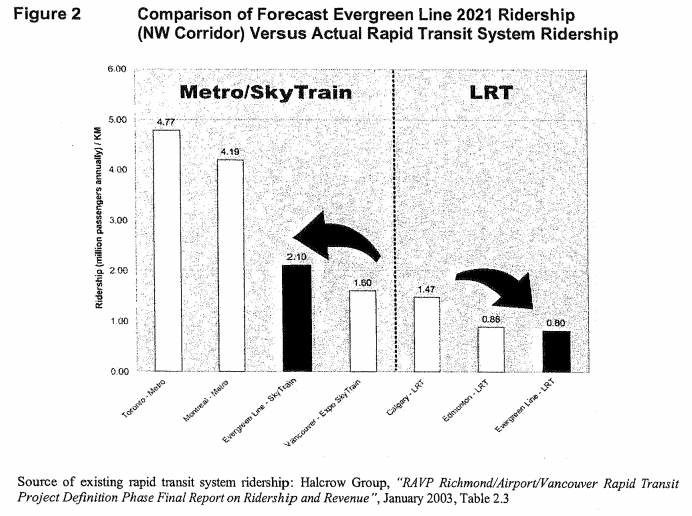 To avoid being drawn into inane technological arguments, I will be referring to ‘shared-grade rail’ and ‘elevated rail’ instead of skytrain or metro and light rail, since grade separation is the real contention. Malaysia’s busiest railway line is about to receive an injection of new trains. Bombardier and Prasarana launched the first next-generation SkyTrain technology vehicles (Innovia Metro 300) yesterday in Kuala Lumpur, beating Vancouver to the task. The next-generation, 4 car vehicles feature a next-generation design with larger windows. 56 cars were ordered, both to serve an extension of Malaysia’s busiest railway line (the Kelana Jaya Line) and increase its service frequency to beyond 3 minutes. The new train features a humongous front window and side windows that go down to waist-height, which I can imagine would provide exquisite views from inside the vehicle. Similar trains have already been received at SkyTrain OMC and are undergoing testing here in Vancouver right now, although an unveiling event has yet to be announced. For Kuala Lumpur, the first train is to undergo a testing phase that starts now, and ends at around May of this year – at which time the new-generation train will enter service. With two SkyTrain technology extensions now in the works in Kuala Lumpur (the current extension of the Kelana Jaya Line and an all new “LRT3” Klang Valley Line), Bombardier’s Innovia Metro 300 vehicles will be seeing a lot of service in Malaysia for years to come.